No one ever said that setting up surround sound home theater was going to be a piece of cake. And, as most enthusiasts and newbies have discovered, it's not simple. But there are ways to try and keep it manageable. One of the most confusing subjects for first-time owners of surround sound A/V receivers is correctly setting the speaker and crossover menu. If you’ve ordered a 5.1-channel home theater speaker system complete with subwoofer, most of us understand that the subwoofer takes over much of the deep bass energy from the other speakers in the system. But where we all go wrong is assuming that we have to adjust the "crossover" in the subwoofer in addition to the crossover in the receiver’s setup menu. For most installations, there is just one adjustment, and it’s made in the receiver’s speaker setup menu. All A/V receivers have a single RCA jack labeled "Subwoofer Out" or "LFE Out", which stands for Low Frequency Effects, Dolby’s term for the .1 subwoofer channel. 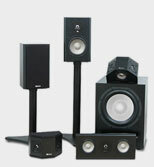 When you call up the receiver’s speaker setup menu on-screen, there will be a question regarding whether you have a subwoofer running and what crossover frequency you want to use (some receivers may not give you a choice of frequency; they will likely be factory set at 80 Hz or 100 Hz). 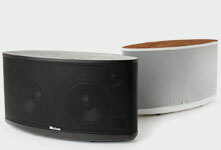 If you are using a subwoofer, choose the subwoofer "On" setting, and an 80-Hz crossover frequency. 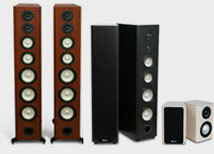 With Axiom bookshelf or center-channel speakers, or any other bookshelf or moderate-size two-way tower (e.g., the M40ti), set them to "Small". While you are at it, set the surround speakers to "Small" as well. In this mode, the receiver will route all deep bass frequencies below 80 Hz to the subwoofer via the receiver’s rear-panel "Subwoofer Out" jack. Axiom's Flagship Subwoofer, the Epicenter 600 Intelligent DSP Sub, features our trademark vortex ports and an aluminum woofer, as well as proprietary algorithms to control every frequency – without distortion. 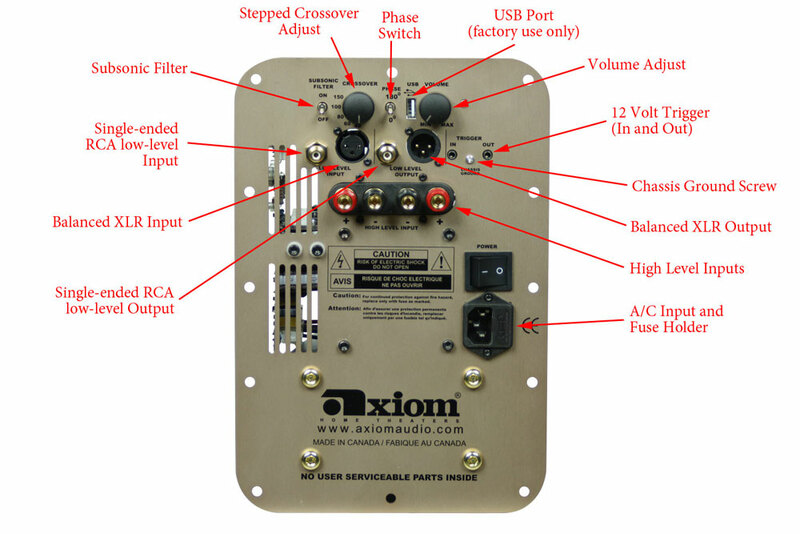 For Axiom’s larger tower speakers—the M80s, M60s, and M50s—depending on the particulars of room size, start by selecting the "Large" setting on your receiver for the left and right main speakers, and "Small" for the center and surround channels. With these settings, and the subwoofer set to "On," most receivers will route full-range sound, including deep bass, to the main left and right speakers, and bass below 80 Hz to the "Sub Out" jack on the rear panel of the receiver. (Some rooms may benefit from smoother bass by getting deep bass from three room locations—the sub plus the main left and right speakers—rather than a single subwoofer.) If running your left and right fronts on "Large" produces too much bass output, change the settings for the mains to "Small." You can also experiment with crossover frequencies, raising the center-channel crossover frequency to 120 Hz if you find that results in smoother dialog sound with less coloration. But 80 Hz is a generally desirable crossover frequency in most applications. Make sure you connect a single RCA coaxial cable from the "Sub Output" jack to either the left or the right line-level RCA input on the subwoofer. You don’t need to use a Y-adaptor to connect both jacks. But you do want to set the subwoofer’s crossover to its maximum rotation so you remove it from the circuit. This is done to avoid "cascading" two crossovers, which might cause uneven and erratic deep bass output. 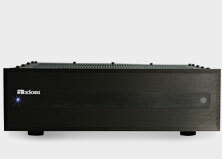 The only occasion where you will need to use the subwoofer’s built-in crossover control is when you are not using a line-level "Sub Out" connection from an A/V receiver. 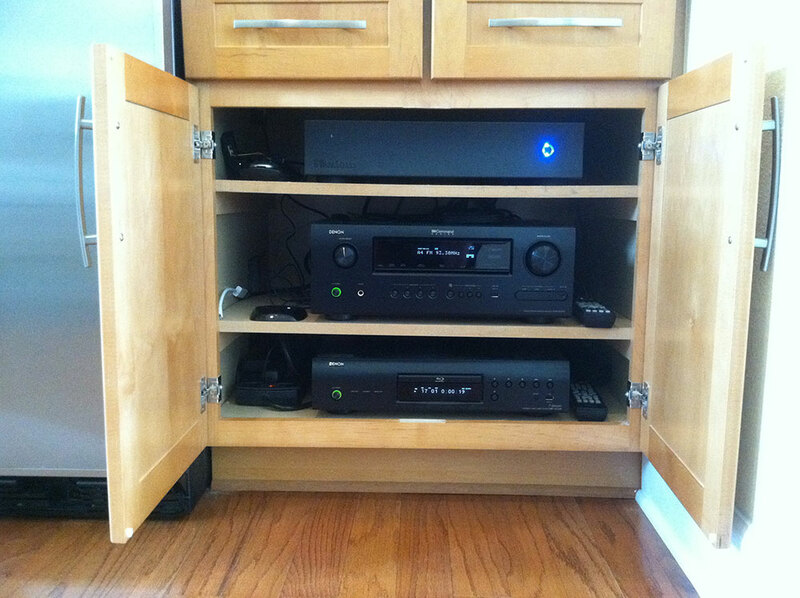 If you are running an older two-channel stereo receiver or an integrated amplifier that lacks a subwoofer output jack, connect the subwoofer by running the receiver’s left and right speaker cables to the subwoofer’s high-level or "speaker-level" input connectors. A second set of speaker cables would then run between the subwoofer and your main left and right front speakers. In this scenario, you would adjust the subwoofer crossover control to achieve a smooth blend between your main speaker’s bass output and the subwoofer’s deep bass output. Again, setting the sub’s crossover control to the 80-Hz position is a good place to start. If you use a crossover frequency much higher than 80 Hz, deep bass will start to be directional, so you risk hearing the subwoofer as a "source" of sound, which is what you want to avoid. Of course, if you have your subwoofer at the front of the room near your main speakers, it doesn’t matter if the sub’s output becomes directional. You can use a higher crossover frequency if you get a smoother transition between the mains and the sub. In either scenario, a good alignment DVD such as the Sound &Vision Home theater Tune-Up disc is a useful tool for fine-tuning the balance between the subwoofer and your main speakers. The RadioShack sound-level meter is also helpful when used with the Tune-Up DVD subwoofer test signals.